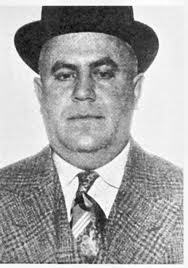 Danny Hogan was a gangster and boss of Saint Paul, Minnesota’s Irish Mob during Prohibition. Originally born in California, he settled in Saint Paul around 1909. He turned to organizing major crimes in the city. He became so closely connected to Saint Paul’s political machine that the police not only feared him, but actively protected his associates. Known as the “Smiling Peacemaker” to local police, he was ambassador of sorts for Police Chief John “The Big Fellow” O’Connor. He owned the Green Lantern saloon on Wabasha Street in Saint Paul, which was also an illegal gambling casino, and became a speakeasy during Prohibition. He also planned armed robberies in the towns surrounding the Twin Cities, and also in money laundering and casino gambling in the Minneapolis-Saint Paul area. Hogan was described by the Justice Department as “one of the most resourceful and keenest criminals” in the nation. He acted as an “ambassador” for Chief O’Connor and the visiting mobsters. On December 4, 1928, Danny Hogan got behind the wheel of his car and turned on the ignition. A bomb located beneath the floorboards detonated and blew off his right leg. He slipped into a coma at the hospital and died nine hours after the blast.